As The ASA begin to suspect that Jefferson Pierce is Black Lightning, they arrange to have him arrested. 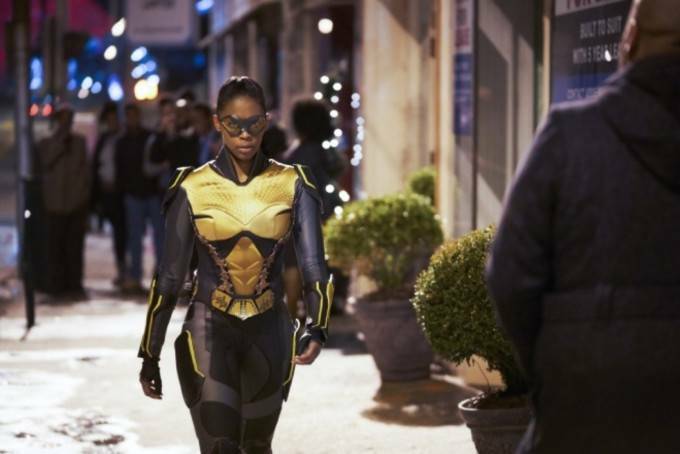 Lynn seeks help from Inspector Henderson, as Gambi and Anissa work together to show the public that Black Lightning is still running around the streets of Freeland. Cress Williams' performance here is easily his strongest to date as Jefferson Pierce. The non-verbal acting as Jefferson is dehumanized during his arrest and time in jail is fantastic. There's another great moment as you can feel his shame when he is given a chance to come clean to Inspector Henderson about being Black Lightning, declines to take it, and Henderson says he's going to help him anyway even though he knows that something is being hidden from him... all conveyed without a word. The direction of the second segment in which Jefferson is arrested is amazing. The cinematography and use of music - an ironic recording of This Land Is Your Land - is easily the strongest moment yet in the series' history. The original Black Lightning comics also saw Inspector Henderson working against corrupt cops in his own department. One of the older metahuman captives shows abnormalities after being moved. An ASA scientist says that the internal temperature fluctuations are affecting their vital signs. He thinks this is a result of moving them on back-to-back days, but that things should stabilize now that they are powered on in a new location with a consistent pod temperature. Gambi hacked a nuke-tracker satellite to detect an abnormal energy field in Freeland. Jefferson's "electric vision" doesn't work through grounded security doors. Gambi guesses that The ASA figured out how he was tracking the life-support pods and found a way to shield them from a satellite scan. Even with the pods being shielded, Gambi thinks he can locate them by using a radio signal. The energy signature of the pods will light up once the radio signal hits them. Gambi developed a subperiosteal hematoma as a result of his recent injuries. Gambi develops a prototype hologram projector in half a day using parts he cannibalized from The Sanctum. Gambi: Make sure he makes good choices, okay? Anissa: How exactly am I supposed to do that? Anissa: (frustrated) Come on. Make it plain, Uncle Gambi! Gambi: Anissa. Look at your father. And your father's father. Protecting people is in your blood. There are certain things no one can train you for. Everything you need is already inside you. Tavon: Well, ya'll not just gonna take Mr. Pierce. Cayman: Look, son. This ain't no rap video. Step aside! Tavon: Hey, look - my daddy's last name is Lamont and you damn sure don't look like a Lamont. Jefferson: Tavon. No one wants to see another black man in cuffs today. You want to help? Keep doing what you're supposed to be doing and make sure all the other students do the same. Can I count on you? Jefferson: I didn't hear you, Tavon. Tavon: (loudly and clearly) Yes, sir. You can count on me. Inspector Henderson: Lynn, look at me. (pauses) Do you trust me? Lynn: No. But I know Jefferson does. Lynn: I know you're scared. It's okay to be scared. Jennifer: I'm not. (scoffs) Dad told me to be strong for you. Lynn: It's okay to be strong and scared at the same time. It's called having sense. Jefferson: I don't know how things are going to be moving forward. Gambi: I don't expect you to forgive me. Jefferson: I might not be able to. But I still can't forget what you've done for me. For my family. (pauses) I want to find a new balance. Somehow. Gambi: ... okay. Just let me know what you need from me. Jefferson: I need you to help me save those children. One of the captive metahuman is experiencing complications after being moved. Kara Fowdy has some kind of quota for tracking metahuman kids with The ASA. Black Lighting blows up one of The ASA armories that is full of anti-Black Lighting weapons. Kara Fowdy still refuses to believe that Jefferson is Black Lightning, but agrees to move against him when pressured by her bosses. Gambi has had several subperiosteal hematoma in his life. Deputy Chief Cayman - the crooked cop working for Tobias Whale - is who Kara contacts to set up Jefferson. Jefferson tells Anissa about the events of 109 and Gambi's being tortured by The ASA. Despite acknowledging that Gambi didn't give him up under torture, Jefferson still doesn't trust Gambi completely anymore. The problematic captive metahuman dies. Jennifer just got her driver's license. Jefferson drives a blue Volvo wagon. Jefferson is framed for possession of Green Light. The full name of the girl who Two Bits saw getting abducted in 110 is revealed as Neema Summers. Gambi calls his base under his tailor shop The Sanctum. Henderson calls in a lifetime of favors to determine that Detective Glennon, who was working with Deputy Chief Cayman on Jefferson's case, is on the take and that his son paid cash on constructing a brand new house. Henderson tells Glennon he doesn't want him - he wants his help bringing down Deputy Chief Cayman. Kara Fowdy pleads with her bosses to free Jefferson Pierce after Black Lightning and Thunder are seen chasing a car while Jefferson is in jail. She is told to mind her own business. Glennon confesses to planting the evidence in Jefferson's car at Cayman's direction. Henderson arrests Chief Deputy Cayman. Jefferson is cleared of all charges. Henderson is promoted to Deputy Chief of the Freeland Police Department. Gambi joins The Pierces for dinner and leads them in prayer before the meal. Another solid episode. Possibly the best one to date. Everything works perfectly.